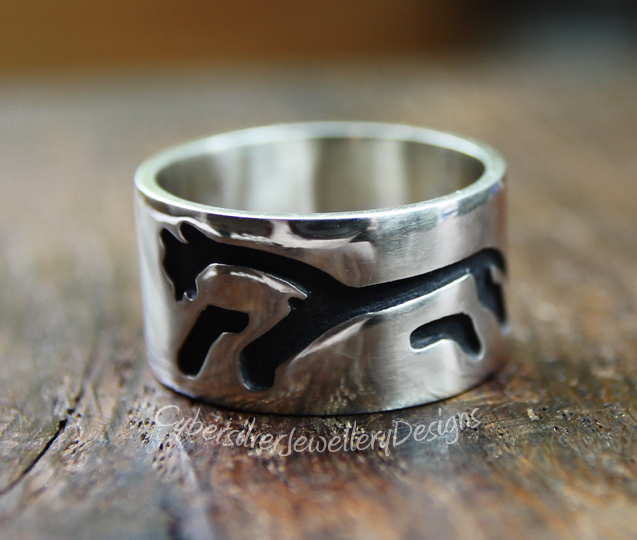 This stunning solid silver ring has been entirely handmade by me in my Oxfordshire studio and depicts the amazing white horse at Uffington. The stylised horse is cut into the silver to echo the way the horse is cut into the chalk at Uffington and has then been oxidised to bring out the detail against the polished silver. The silver is then waxed with a microcrystalline wax to help protect the oxidised surface. Oxidisation is a surface treatment that can lighten with wear. Uffington is the oldest of all the white horses and was created in the Bronze Age. It's believed that the horse could have been cut by worshippers of the sun god Belinos or Belenus, who was associated with horses. He was sometimes depicted on horseback, and Bronze and Iron Age sun chariots were shown as being drawn by horses. This may be why the horse was cut into the chalk on the shallower slope at the top of the hill so that he could be seen from above by the god himself.